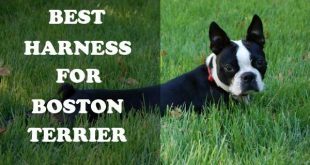 How to choose the best harness for French Bulldogs? 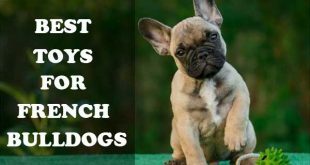 French Bulldog is one of the most appealing breeds, as they stole the hearts of millions, and there are many reasons why. Their modest size, playful appearance, loyalty and love, bring joy to everyone that approach near them. A well-known fact is that the Frenchies are born with many health problems. The most serious one is the “brachycephalic” syndrome, making it hard for them to breathe properly. Because of this “anatomical glitch”, it is recommended for every Frenchie owner to purchase a harness, not a collar. However, choosing the right harness can be tricky task. A lot of people find the squishy face of the Frenchie adorable, but not many are aware this is the outcome of the brachycephalic syndrome, which makes the whole life of the dog very troublesome. The whole “cute face” actually hides a narrow windpipe, large tonsils, choking up the back of the throat long soft palate, and narrow nostrils. The whole image makes the inhale extremely complicated, as the air that goes into the lungs is not enough, which makes every vigorous exercise physically agonizing. When the weather becomes hot, you need to keep the dog away from direct sunlight, as the breed is also prone to heatstroke. If you live in an apartment, then Frenchies can be the perfect choice for you, as they don’t bark a lot and are not a big breed. Because of the brachycephalic syndrome, you need to be prepared for loud snores, as the breed also breathes heavily. Although, the dog won’t bring you problems with the neighbors, it may bring some for you. A collar is definitely not a recommendation, as it goes around the throat, as this puts pressure on the windpipe. If you pull the leash while you are on a walk, the outcomes can be devastating. 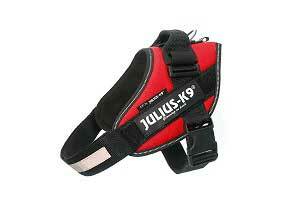 French Bulldogs require a nice harness that will fit comfortably, as it guarantees your dog won’t be hurt in any way. Should we walk a French Bulldog on a harness or a collar? As it was mentioned previously, the best choice you can make is to purchase a harness, as once you pull the leash, the force will spread around the chest of the dog, not on its throat. Another important factor is how your dog acts when it is outside. If the dog walks without any pulls on the leash, then a collar might also do the job. 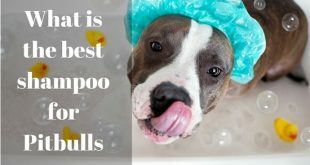 You need to ask yourself the following questions, in order to determine what is the best for your doggo. Does your Frenchie have breathing problems? In the beginning of the article, you found out that almost every Frenchie suffers from Brachycephalic Airway Syndrome. If after you examine your dog and notice it has an elongated soft palate or narrowed nostrils issues, the best choice is to get a harness, as this will prevent many unwanted consequences. The pressure will go around the chest of the dog, as this won’t affect the neck and airways. If you use a collar, even a single pull on the leash can lead to airway collapse. Does your Frenchie pull or lunge on the lead? There are cases where the dog does not suffer from breathing problems, but it is better for you to stick to the safe side and use a harness. The collar brings strain on their neck and airways, as this is definitely not what you or your dog dream of. A harness is more safe and comfortable in every aspect. Things become harder now, as choosing a harness that will fit perfect on your Frenchie can be tough. 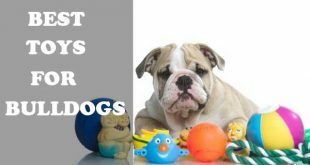 The good thing is that you are reading an article specially created to make your choice easier, as here you will find the best available models, that will suit your French Bulldog. Here are some other questions you should find the answers for. 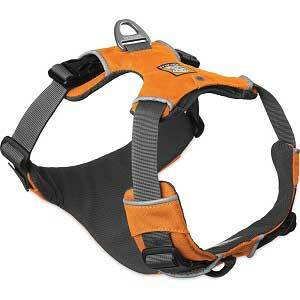 On first place, you should find a harness that will fit comfortably on your dog’s chest. Consider the fact that this harness will go through a lot, such as beach walk, or walk in the rain. When the harness gets wet, the last thing you want is to make your dog feel uncomfortable. This is а common occurrence with most of the cheaper cross-body harnesses. If you want to exercise the agility of your Frenchie, this factor might be important for you. The handle of the harness can be helpful for you, when the dog is up the ramp, as it can be used to prevent fallings. Finding the harness that will fit the dog is extremely necessary, if you want to save your dog from unpleasant rubbing against the tender skin or causing pain under the dog’s arms. If you learn how to measure the harness for your dog correctly, then those outcomes won’t affect you. Getting a measuring tape. Knowing the exact measurements of your dog can save you from many troubles. Although, most harnesses are sold by the weight of a dog, combining the measurements in centimeters or inches and the weight can be the key of finding the ideal size of the harness. If your dog is energetic, you may need an assistance from someone, in order to get the dog, stay still, while you are getting the measurements. Measure the broadest part of the chest. Right behind the armpits is where the broadest part of a dog’s chest is. In order to get the correct measurements, wrap the tape over the back and around the chest, as you try your best not to pull it tightly. Better leave it snug. Combine the measurement and the weight of you dog to get the correct size for the harness. A nice hack you can use is to search for a harness that is not more than two inches larger than the measurements of your dog, as after that you look at the weight range. Watch out for harness that weight range fits your dog’s weight. Sometimes, there are harnesses that don’t meet the dog’s weight. A tip here if you hesitate between two sizes is to get the bigger one, because the smaller one cannot be adjusted to be more loose, whereas the bigger size fit can become tighter. When you just got your puppy, all you want is to play with him and enjoy its company. When it reaches eight weeks, you should take it a harness in order to get used to it, not to restraint it. Be sure you get a harness with comfortable fit, so that way the dog feels like it is cuddling, rather than being restrained. Another reason behind this decision is that the harness will still act like a piece of safety equipment, as it will secure your puppy. This model here is one of the favorite ones on the market. The colors are playful, as you have a big variety of choices. The harness is definitely one of the best choices when it comes to safety. The model is eco-friendly, as it is made of recycled water bottles. 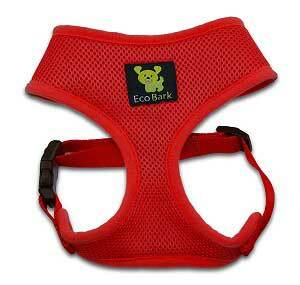 When your puppy walks, it will feel only the comfortable touch of the breathable, lightweight and padded mesh vast. 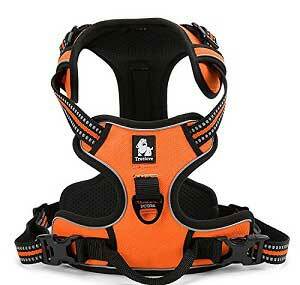 This harness will be the best introduction choice for your puppy, as it will totally adore the product. It is important for you to find the right one, as the puppy should get used to wear such a vital piece of equipment. Because of its colorful and ecological appearance, it is definitely the most appropriate choice for you to make. Getting the right size is the hard part of the task. 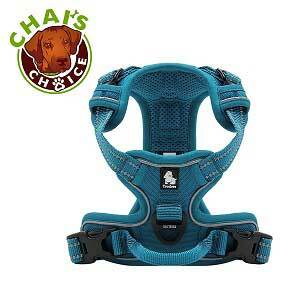 You need to know the exact measurement of the dog’s head, as the vest-like design of the head hole is not adjustable. A suggestion is to get one or two sizes bigger, as the puppy grows very fast, and it is better for you to save some money from such purchases. To get the correct measurements, after you did the calculation, compare it with the measurement for the neck opening of the harness, so that way you are sure everything went as planned. Once you do this and get the right harness, your puppy will absolutely adore it, as it will be willing to go on walks. What are the Best harnesses for French Bulldogs? The harness is crafted to keep your dog comfortable the whole day, which makes it one of the most loved models on the market. The model has many advantages, but the first one we will talk about is its adjustability. There is no chance of mistaking the Frenchie with another breed, as it’s big ears and his large head makes it stand out from the crowd. Its big head looks very out of proportion compared to the whole body, as finding a right harness for your adult buddy can be tough. The fixed neck harnesses can be tricky, as there are two possible endings- a harness with a neck opening that is large enough can go through the head, but around the chest it will have a baggy fit, making it too big. That’s why many owners of Bulldogs recommend exactly this Ruffwear harness, as it is made to offer an exceptional number of adjustable fitting points. There are four separate adjustment points, making the fitting ideal for every Frenchie, as there won’t be any irritations such as rub or chafe. If your dog is one of those that pull on the leash, then this harness is another reason why to get it. The harness includes nicely padded chest and body panel, as if there is any force involved, it will be nicely dispersed so that nothing cuts into the dog. The D-ring on the back of the harness is durable enough to guarantee a full control over the dog, as the chances of breaking are minimal. For everyone that wants to have a superior control over the dog, or do a lot of training sessions, the front webbing attachment point will come handy. You have the option of choosing from a big variety of colors, as it is all up to you and your personal preference. When you walk your dog in low light levels, the reflective strips will be very helpful at dusk. Do you need to catch your Frenchie easily? If your dog is an energetic one and needs to be catch easily, there are harnesses that have handles on the top, making it perfect for all the owners tired of carrying their dogs around. This harness is all you need, because of its high quality, Velcro system on the chest and interchangeable patches, making the product perfect for every type of dog. Reflective edges and chest strap: The harness has many functions, as one of the most important ones is that it works just like a visibility vest. When you take your dog for a walk at night or in low light levels, the used reflective materials of the edges of the harness and the grey edges of the harness will help you spot the dog in no time. Breathable, skin friendly inner lining: The manufacturer made the harness following the highest international standards, as the material OEKO-TEX was included. Heavy-duty buckles: The buckles are high quality one, as they are made to be extremely durable, which makes them the perfect choice for every occasion and weather. Front Range No-Pull Dog Harness. 3M Reflective Outdoor Adventure Pet Vest with Handle. This model includes everything an owner will ever want. The harness is extremely stylish and durable, as the outer layer is made of Scratch-Resistant Oxford material, making the whole harness super lightweight. The Draflex Buckle is also extremely lightweight, as it has a large loading capacity that greatly improves tensile strength. The fit is ideal, thanks to the ergonomic and comfortable design, that also make the putting and taking off very easy. The model also includes Nylon webbing with 16M reflective material, which makes the walking in low light levels easy and safe. When you are riding your car, the steady handle that can be attached to any seat belt will keep the dog safe and secure. The model has a Mesh lining, that is extremely lightweight and comfortable, because of the sponge padding placed around the chest and belly areas. You can choose from three colors- green, black and orange. For all the people that are looking for durable, safe and stylish harness vest, this product is all they are looking for. When you are traveling, you dog will be secured, thanks to the sturdy handle. This will guarantee your pet won’t move around or try to jump out, as it will be completely restrained from such actions. The location of the handle makes the design really smart, as you can attach the harness to your seat belt. There is no chance of getting the dog choked, no matter where the harness is attached to. 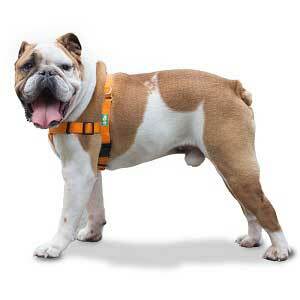 This harness is perfect for injured or handicapped dogs, as it provides better support. The model is recommended for all the injured dogs that are in their recovery process. It can help the owners support the dogs at different activities, such as climbing stairs. If you are not happy with your purchase, you can return the harness and get your money back in 30 days after you bought it. There is a law that states every dog should be restrained so they can’t distract the driver while travelling. It is important for you to secure your dog, as it is a member of your family, and safety comes first. A lot of owners have only a walking harness, as when it is time to travel, the harness does not do the job in the car, as it is not designed for such acts. That’s why you should hit the market and find the best travel harness for your dog and prevent unpleasant outcomes if something happens while you are on the road. This is a travel harness that will make the traveling with a dog pleasant for everyone in the car. If an emergency stop occurs, you dog will be secured, thanks to the seatbelt fixing points, that will keep the dog in place, without hurting it in any way. Another bonus is that there is no chance of choking or putting a lot of pressure on certain part of the dog’s anatomy, because of the clever design, that spreads the kinetic energy force in equal parts. The good thing about this harness is that it is 2in1, which means it can be used for a walking and for car safety restraint. You will reach your destination safe and sound, all because of this multi-functional product. In order to attach it to the seat belt, you will use a tether that slips through the seatbelt, which after that clips onto the harness with a karabiner. The harness was tested, as it can restrain dogs up to 75lb in a car crash. Does your Frenchie pull on a leash? The only major disadvantage of the harness is that it allows a dog to pull. That’s why many people prefer getting a collar, that acts as a restrainer for the dogs to pull, as it puts pressure on its throat. If your dog pulls on the leash, the best solution is to get a no-pull one. 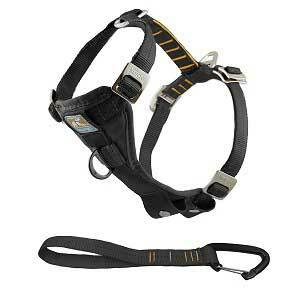 The company that creates the best no-pull harnesses is GoPets, as the following product will show you why. The whole process to put it on takes not more than a few seconds, as you slide the neck loop over the head of the dog, then pass a strap between the front legs, as the last step is to just buckle it up. If you Frenchie has a bigger head, the harness is adjustable, so that won’t be a problem at all. You can be sure that when you go on walk in the dark, the dog will be easily noticed, all because of the orange hi-visibility strong webbing. It is visible even from the cars. There are two options, when it comes to the no pull action. The first one is to attach the leash to the back of the harness, so that way when the dog tries to pull, the girth strap gets tighter, showing the dog those actions are not allowed. The other option you have is to connect the lead with the ring of the front breast area of the harness, so when the dog tries to pull, it works like a mechanism that turns the dog around. Another advantage of this method is that the dog will learn how to walk next to you, without using the self-defeating method of pulling. Almost every dog owner that uses this harness strongly recommends it. The best thing of this harness is its adjustability, that helps you adjust the harness to fit perfectly the shape of the Frenchie. Be prepared for your dog to act strange of the turning action method, as they find their way how to side step it. Make sure you put the harness away from the dog’s teeth, as there is a chance for it to try to chew it. After all, if this method does not work as you wanted, there is another option that can be tried. GoPets’ product is the perfect starter pack you need in order to learn you dog how to act while you are walking it. If you prefer a collar? There are certain collars on the market that may do the job for Frenchies. The most important factor you should watch for when you are buying a collar is to know if it spreads the pressure around the throat at equal parts. The best collars for this task are the one made of high quality leather. This product right here is made of high quality leather, which has 100% genuine leather top surface. It is crafted to be steady, comfortable and pliable, making it wide dog collar suitable for everyday use. 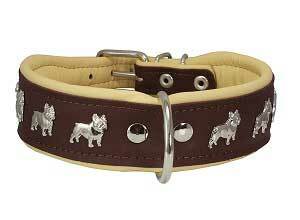 The collar gives the dog a soft cushioning feel, thanks to the soft leather oversized lining. You have the option of choosing from bright colors, that make the collar look elegant, smooth and unique. The best thing is that it is enhanced with nickel plated bulldog figures. This collar right here is perfect for every fashionista out there, that want to add extra dimension to her dog’s appearance. The collar’s both sides are made of 100% genuine leather, which offers the dog a maximum comfort. The quality and design of the collar are unique by their own. Buying a collar for Frenchie is extremely pesky job, as sometimes you need to pay more than the usual, in order to give the dog what it really needs. Although, the Frenchies are extremely cute and adorable, as they stole the hearts of many people around the world, there are some fact about them that should not be neglected. The breed is known to have many health problems, as the breathing one makes the life of the dogs a bit harsher. 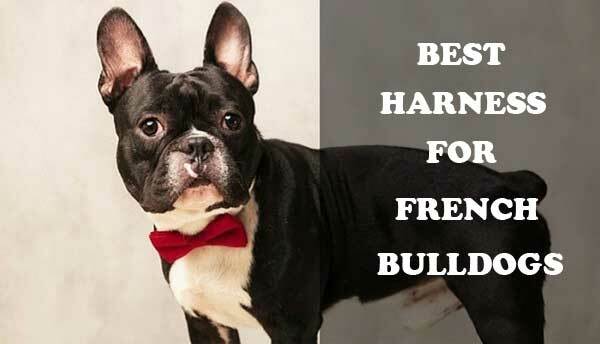 That’s why every owner of Frenchie should be 100% committed to their dog. Finding even a suitable harness for the dog is a tough mission. The variety of harnesses on the market is huge, but you should watch only for those that will suit the requirements of the breed. Safety comes first, that’s why getting a multi-functional harness can save you money and unwanted aftermaths. To give your dog everything in one, a no -pull harness will help you teach the dog what is and what is not allowed in its behavior. The comfort is another huge factor, as you should consider getting a harness with nice cushion paddings, which will guarantee for all-day comfort. Last, but not least, be sure you are investing your money in high quality product, made only from top quality components, as the production company has a good name on the market. The durability is another important aspect that should not be ignored. Previous Can Dogs Eat Apricots? Are they Good or Bad for Dogs?